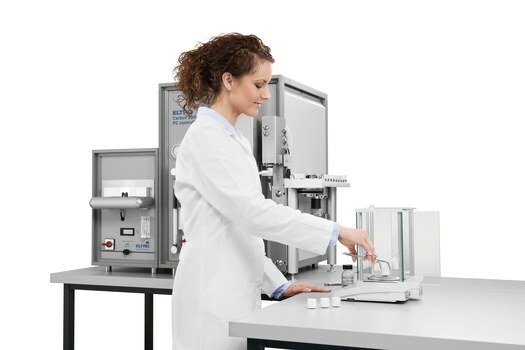 Elemental analyzers are important tools for quality control of a wide range of products. A variety of matrices, such as ceramics, coal, steel or soil, can be analyzed for their element concentrations with different types of instruments. The product range of Eltra GmbH, located near Düsseldorf, Germany, comprises analyzers for C, H, N, S, O and thermogravimetry which allow for the standard-compliant determination of carbon in various chemical bondings, as well as oxygen and nitrogen in SiC and in materials containing SiC. The requirements which have to be fulfilled for a standard-compliant analysis may, however, vary greatly, depending on the desired parameters. Silicon carbide has a high melting point of 2,700 °C and is therefore an important raw material for refractory and ceramic products. Another characteristic of SiC is its resistance against chlorine and strong acids, also at high temperatures. Thanks to a hardness of 9.6 Mohs, it is also used in the metallurgical industry for the production of abrasives and polish. The European standard series EN ISO 21068 (2008) regulate the chemical analysis of silicon carbide and raw materials containing silicon carbide. Part 1 deals with sampling, part 2 with the chemical analysis of carbon, silicon and loss of ignition and part 3 covers metal analysis and determination of oxygen and nitrogen concentrations. Eltra combustion analyzers are well suited for the quality control of refractory and ceramic products which contain silicon carbide. This article outlines the possibilities and limits of elemental analyzers when dealing with these materials. The determination of thermogravimetric parameters such as, for example, loss of ignition, is described in the second part of ISO 21068. Thermogravimetry is based on the continuous recording of mass changes as a function of a combination of time, temperature and atmosphere. The standard clearly defines the use of muffle furnaces and balances for this process. All methods described in the standard use a defined sample container made of steel, ceramic material or platinum which is preheated at the prescribed temperature between 250 °C and 1050 °C. The sample weight is not always defined (e. g. loss on drying LOD250) or ranges from 2 – 5 g to 1 kg (change of mass in air at 200 °C and 400 °C). After weighing the sample and applying the defined temperature program (e. g. for LOI850, heating up to 850 °C and maintaining for 3 h), the hot crucibles need to cool down in the desiccator and are then weighed. Thermogravimetric analyzers which are equipped with a combination of furnace and balance considerably simplify the manual procedure. Usually, these analyzers have an interior chamber which can be heated up to 1,000 °C and a separate weighing cell in the analysis chamber which is connected with the furnace by a ceramic pedestal. A rotating carousel places up to 19 different samples, one after the other, on the pedestal to be weighed. The market offers thermogravimetric analyzers for both small sample quantities (e. g. 20 mg) and quantities of 5 g or more (such as Eltra’s Thermostep, fig. 1). By using an empty reference crucible, thermal buoyancy is compensated and measurements can be carried out reliably even at high temperatures. The ceramic crucibles usually have a volume of 12 ml, allowing for sample weights of up to 5 g. This, however, is not very practical due to the high filling level. So far, the DIN EN ISO 21068-2 standard does not mention automated thermogravimetric analysis. If a thermogravimetric analyzer is used for the determination of LOI850 (loss on ignition at 850 °C), the specifications of the standard can be met to a high degree, if not 100 %. For a series of tests the standard Euronorm CRM No. 781-1 was weighed into crucibles which had been preheated to 850 °C in Eltra’s Thermostep. Figure 2 shows a typical measurement curve, table 1 contains the corresponding results. The standard was first dried at 105 °C over night and then 3 crucibles were filled with 1 g each. The LOI850 value measured with the Thermostep correlates well with the value of free carbon stipulated in the standard. % by mass mass (informative value) no. An advantage of the thermogravimetric method is the fact that the samples, after having been heated, are not submitted to ambient air; however, due to the selected weighing and measurement process it only represents an approximation to the ISO standard. Currently the method cannot be adapted to further parameters which is partly due to the required high temperature (LOI1050) resp. to the large sample weights (LOI200 with 1 kg sample volume). Due to the missing reference material, validation of the process remains a difficult task. Part 2 of the ISO 21068 series also describes the analysis of silicon carbide and its carbon content. A careful differentiation has to be made between the total carbon content and the SiC-bound carbon content. Depending on the relation of the two bondings, different analysis methods are stipulated in the standard. There are various ways to determine the total carbon content in silicon carbide samples, which differ in the combustion method (resistance or induction furnace) and in the detection method. Coulometric, gravimetric and conductometric methods don’t require calibration. The carbon content can be determined by measuring the weight, the electric charge or the conductivity. For these detection methods the requirement of chemicals is high; moreover, the market doesn’t offer adequate instruments. Alternative procedures permitted by the standard include the use of elemental analyzers with induction furnace (Eltra CS-800) or resistance furnace (Eltra CS-580) as well as detection with infrared cells. A combination of the two combustion technologies and a combined usage of the detectors have been realized in Eltra’s CS-2000 analyzer (fig. 3). Resistance furnaces with ceramic tube operate at lower temperatures than induction furnaces. The ceramic combustion tubes allow for a maximum temperature of 1,500 °C. To safely oxidate the total carbon in the silicon carbide to CO2, resistance furnaces require the addition of accelerators such as lead borate or tin powder. Due to a temperature of approx. 2,500 °C the oxidation of silicon carbide tends to take place more quickly and more reliably in an induction furnace; moreover, the measurement results show fewer variations (see table 2). Whereas the accelerators for the resistance furnaces are used for oxidation (lead borate) or local temperature rise (tin powder), the metal accelerators used in induction furnaces are required to ensure combustion in the first place, as silicon carbide has no proper electric conductivity. A clearer definition of the calibration methods for the various procedures would be a welcome extension of the standard. Though [1-2] mention suitable calibration materials, the calibration with graphite or calcium carbonate is only described in detail for the detection method with thermal conductivity cells (chapter 5.4.5). The results shown in table 2 were obtained by calibration with graphite. This parameter can be easily determined with elemental analyzers. The standard stipulates the use of an analyzer with resistance furnace and infrared detection; however the direct determination is limited (chapter 6.4.1). As the upper limit for the free carbon content is given with 2 %, analysis solely by combustion, for example of the Euronorm standard CRM 781-1 with an informative value of 37.22 % is not permitted. Thus, characterization of free carbon by direct combustion is practically limited to pure silicon carbide. To measure very low concentrations, the standard specifies the use of a quartz tube (as is used, for example, in Eltra’s CW800 analyzer). The analyzer described in chapter 3.1 of this article is not suitable for this application; due to the usage of different furnaces, ceramic tubes cannot simply be exchanged for quartz tubes. Due to their permeable structure ceramic tubes are not suited for the determination of very low concentrations. Table 3 shows the results of a standardcompliant analysis of the reference material BAM-S003 and additionally of the Euronorm 781-1 standard, carried out with Eltra’s CW-800. The standard was also measured with an analyzer with ceramic combustion tube (Eltra CS-580). The results in table 3 clearly support the usage of a furnace with quartz tube when analyzing low carbon concentrations. If the concentrations are sufficiently high, analyzers with ceramic tubes can also provide meaningful measurement results. In this case, the calibration of the elemental analyzer is of great importance. Whereas higher concentrations can be easily calibrated with graphite (100 % carbon) or pure calcium carbonate (12 % carbon), low concentrations can only be calibrated either with an expensive reference material or a synthetic carbon standard. The SiC content can be determined from the difference between total carbon and free carbon content; however, this is only permissible when the free carbon content is 50 % or less of the total carbon content. This applies, for example, to the BAM S-003 standard but not to CRM 781-1. If the relation between free and bound carbon is more than 25 %, a direct analysis is possible. If the CRM 781-1 sample is freed of surface carbon (table 3), it can be analyzed directly with an induction or resistance furnace (table 4). The third part of the DIN EN 21068 series deals with the determination of oxygen and nitrogen. In contrast to the determination of carbon species, the sample needs to be heated in an inert gas flow (helium) to measure its oxygen and nitrogen content. The inert gas fusion method has been established for many years and is also used for analyzing metals. The stipulated temperature of approx. 2,800 °C can only be realized in an electrode/impulse furnace. An upper and a lower electrode apply voltage to the graphite crucible containing the sample which has previously been purged with inert gas. The analysis quality is strongly influenced by the power line available (approx. 5 kW recommended) and the purity of the flux used (nickel baskets or capsules). These materials are basically used for melting point reduction to release the gasses contained in the silicon carbide from the molten sample. Table 5 shows the results for the BAM S-003 standard obtained with Eltra’s ONH-2000 analyzer. The analysis was carried out with pre-edged nickel baskets and a 5 kW power line. After calibration with a certified steel standard, good compliance with the certified/informative values was achieved. Primary substances (such as KNO3) can also be used for calibration; however, these substances need to be dissolved and diluted first, and are then dried in nickel capsules. The measuring principle does not allow for direct analysis of liquid standards. The inert gas fusion procedure can be easily applied to the analysis of other ceramics with high nitrogen (e. g. Si3N4) or oxygen (e. g. SiO2, ZrO2) content. A comprehensive analysis of silicon carbide and mixtures containing silicon carbide in accordance with the DIN EN ISO 21068 standard series involves sophisticated technical equipment. If the determination of metals, not elaborated on in this article, is taken into account as well, the additional use of spectrometers (ICP, OES, XRF) is called for. The market offers analyzers for standard-compliant analysis of carbon concentrations; however, different analysis specifications require different configurations (induction furnace, combustion in ceramic or quartz glass tube). Oxygen and nitrogen are easily and reliably determined with analyzers using inert gas fusion. For a future update of the standard a more extensive treatment of thermogravimetric methods would be highly recommendable. Modern TGA analyzers not only reduce human errors through automization but, thanks to flexible use of carrier gas and temperatures, provide manifold possibilities to characterize SiC and related products.